This installation occupied the mud room of the house, adjacent to the kitchen, the back door, and the garage, displayed across the room from the installation of rubber fish. 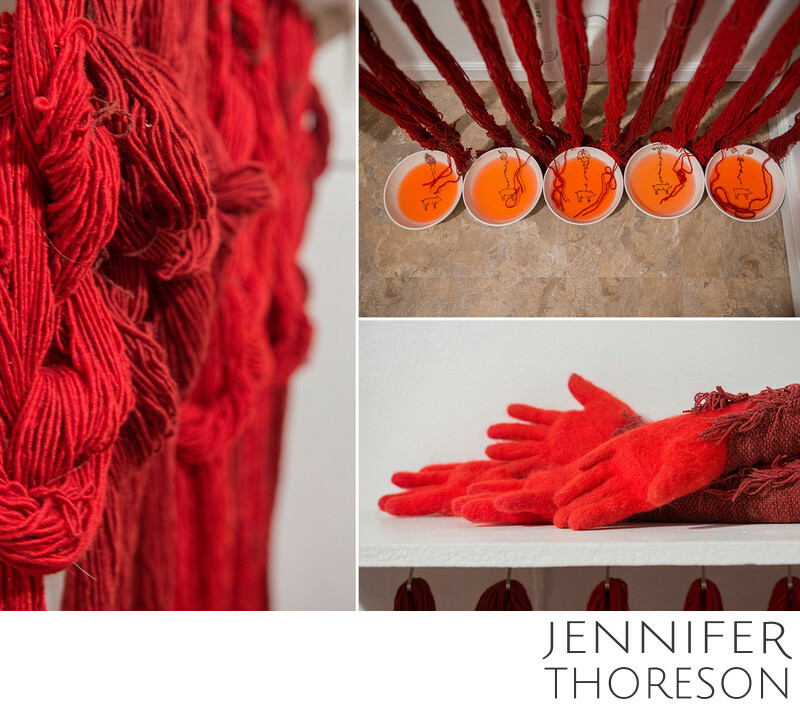 Twelve chains of red wool yarn hung beneath a shelf, and bled red pigment into six shallow bowls of water. I hand-painted each bowl with images of human organs connected to pigs through a leafy vine, an illustration of humanness, spiritual deficiency, and limitation. Installed above the warping chains were two pair of hands formed from the red wool you see in the tumorous sculpture in the photograph, Cancer. The process of reuse and repurpose is important in my work, and illustrates recovery and redemption. Each arm is covered in cloth I wove on my hand loom using red wool yarn. The selvedge of these weavings is left un-tied, resembling the flesh beneath the skin, the parts of that remain hidden and undisclosed. Our hands and our fingerprints, mark us as individuals. Their function elevate us beyond other creatures on the earth, and are responsible for a remarkable part of the human experience. In this installation, the hands simply represent the human body, and the significance of every unique individual. The two pair of hands represent two people as partners, and echo the relationships in many of the photographic works.